Lasagna meets calzone meets stromboli in this Italian-American mash-up. Layers of mozzarella, lasagna noodles, marinara sauce, and ricotta come together to form the center of a French bread loaf. Go gourmet by making your own bread dough, buying fresh lasagna noodles, and using fresh buffalo mozzarella. Choosing fresh ingredients and baking bread from scratch creates a restaurant-quality dish. But if you don't have time to make homemade bread, the recipe variation uses store-bought French bread mix instead. Then, add garlic, butter, and herbs for a crispy golden-brown outside and an oozing middle. Serve this bread as an appetizer at your next holiday party or make it a main dish on a weekend when your family's craving a comfort-food fix. In a small bowl, combine the water, yeast, and sugar. Let it sit for about 5 minutes until it starts to foam. Divide the dough into two balls. Place one in an oiled bowl in a warm spot in your kitchen and allow it to rise until doubled. Freeze the other ball for later use. Bring a large pot of water to boil on the stove. Add the fresh lasagna noodles and simmer for 3 minutes. Remove the pot from the stove and strain the noodles into a colander. Toss them gently with 1 tablespoon oil and allow them to cool. Roll out the risen dough ball on a floured surface into a rectangular form. Place it onto an olive oiled baking sheet or a sheet prepped with a silicone baking mat. Arrange the lasagna noodles, sauce, ricotta cheese, mozzarella slices, and basil in layers lengthwise down the center of the dough. 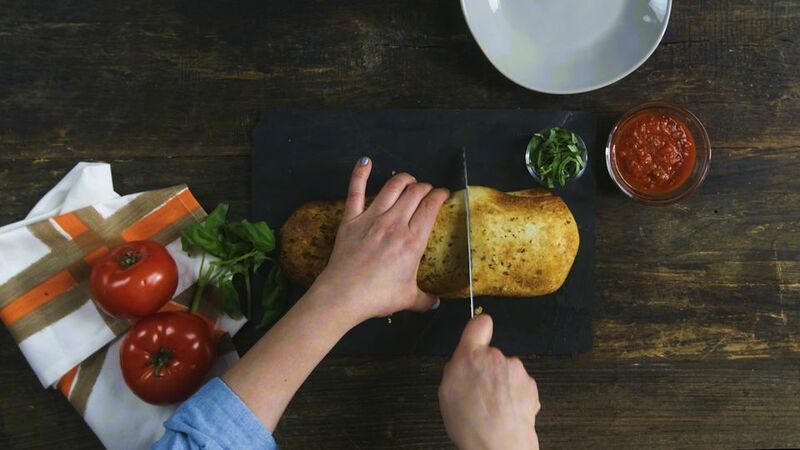 Repeat the layering one time, and then end with an additional layer of just mozzarella and basil. Fold the bread dough over the filling, tucking it in and pinching it closed on both ends, and place it seam side down on the baking pan. With an oiled, sharp knife, place several shallow slashes diagonally down the top of the loaf. Move swiftly and let the knife do the work. This will allow the bread to expand while it bakes, assuring the contents stays inside. Melt the butter in a glass dish in the microwave. Combine it with the minced garlic and oregano. Brush the garlic butter mixture on top of dough. Bake in the oven for 17 to 20 minutes, until golden brown. Cool slightly and serve. Note: For the hack version, buy one can of French bread mix, use cooked, dry lasagna noodles, dried herbs, and regular mozzarella cheese. Then follow the directions above (minus the dough making), and bake the bread in a 400 F oven for 10 to 15 minutes. Cool and serve.